Come to our Jetty Road store and enjoy our freshest waffles covered in the finest Callebaut Belgium chocolate. The founder of the Waffle King, Antonino Malvetti , comes from the Belgian city of Liège. A childhood in Liège is perhaps the best foundation anyone could have for an appreciation of waffles. The Liège sugar waffle is regarded by most people as the pinnacle of waffle development. Nino was introduced to waffles at an early age. While still a schoolboy he was put to work in a streetside caravan which provided waffles to the crowds attending the autumn fair in Liège. Nino came to Adelaide in 2003. While he generally appreciated the city’s character, lifestyle and food culture he soon became aware of a critical deficiency. Unlike Liège, where waffles are freely available and it is a common sight to see pedestrians consuming waffles as they walk, he couldn’t find his beloved waffles anywhere in Adelaide. He solved that problem by importing the necessary hardware and special ingredients to make waffles for himself. From that small beginning a wholesale business gradually emerged which supplied frozen waffles to cafes and other outlets around Adelaide. Eventually Nino wanted to introduce to Adelaide the special pleasure of the freshly-cooked sugar waffle. On June 6th, 2011 the Waffle King opened its retail outlet at Sturt Road, Dover Gardens. Word spread quickly about the quality waffles and crepes on offer. With growing patronage the Waffle King has been pleased to extend its range of waffle specialties, beginning with the fruit waffle, and has also introduced other Belgian specialty products to appreciative customers. Our customers are encouraging us to take our special products and unique style to a wider audience. Franchise opportunities are now available. Perhaps you can become part of the Waffle King family. At the heart of the Waffle King is passion - a passion for great food, a passion for excellence in everything we do, and a passion for making sure that our customers have a special experience every time they visit us. We are certain that our waffles are the best that you can find anywhere. They are made with care, using traditional methods and top quality ingredients. The best waffles deserve the best accompaniments - the Waffle King also offers you the finest Belgian chocolates from Callebaut and a selection of exquisite coffee blends from Nespresso. Of course we also have the best customers - you! Great food deserves great surroundings. It is easy to spot the little (and big!) touches that make Waffle King shops special. Our inspiration comes from the home of the waffle in western Europe. Come and enjoy the special atmosphere that we have created. A highlight of our shops is the magnificent mural depicting a waffle feast in a mediaeval European setting. You must see it! Once you have tasted our waffles you will understand why the characters in the mural are enjoying themselves so much. Discover for yourself the special treat of a visit to the Waffle King. Any time of the day is the right time for waffles. We look forward to meeting you, and to serving you again and again. Our extensive range of waffles and other items are handcrafted fresh every day by Waffle King's industry-leading staff. Whether it be a Waffle, Crepe or Fondue, all our menu items have been crafted through years of experimentation to boast the best tastes, textures and flavours. Nespresso coffee made to perfection to uncover the subtle aromas and flavours, cup after cup. With a long distinguished history originating in the thirteenth century, our waffles boast all the greatest improvements from centuries of development. At Waffle King we offer a variety of waffles from the Liege sugar waffle, Brussels waffle, Fruit waffle and the Syrup waffle. Each served with a beautiful blend of flavours. Our crepes are twice-cooked in the classic European style to ensure their feather-light texture. Emphatically not pancakes! We cater for all tastes with a delicious range of sweet and savoury fillings. If you want to be a little bit naughty (but still nice!) 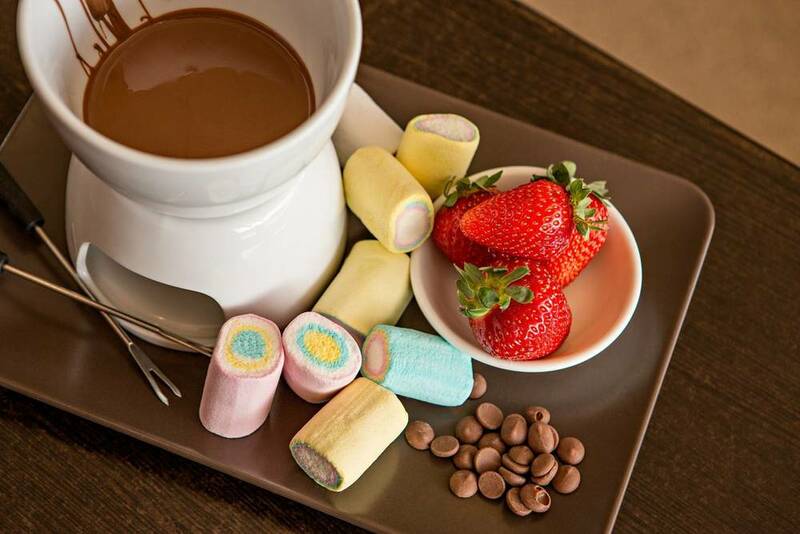 try our delightful chocolate fondues. Waffle King uses only Callebaut's superb Belgian chocolates - choose from classic milk, superb dark or sultry white. Dip into your chocolate with a selection of tasty fruit, marshmallows and lollies to add a new meaning to yummy! Are you looking to join our fabulous family? If you are passionate about offering beautiful food, coffee, and customer service why not enquire about one of our Franchises? Join our enthusiastic outgoing crew. We're always on the lookout for great people, who are passionate about Waffle King to join us and spread the word. Thank you! If you have Resume / CV, please submit via email to ninomtperrin@gmail.com with your name.